I found the first blooms on my vertical strawberries today! They’ve probably been there for a few days, but we’ll say it was today for greater dramatic value. These are flower towers from Lee Valley that I ordered this spring. I got two of them, one for each side of the stairs from my yard to my deck. 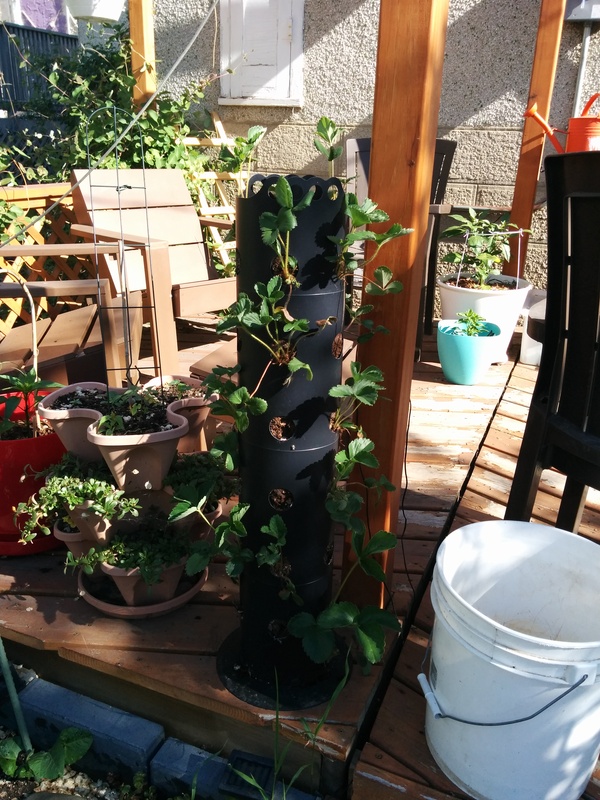 I wanted to plant them with strawberries, with the theory that this would produce a lot of fruit in a small space,and would make it easy to protect the berries from birds if necessary by just draping netting over the towers. When I got them and put them together, I was surprised by how flimsy they felt, and I was a bit concerned. I thought they would come apart, that they would fall over, and that watering them would be too much of a pain. So far, I’ve been pleasantly surprised on all these fronts. They aren’t weighted extra at the bottom, and my initial plan was to put them inside another set of pots, then put rocks around the bases; but upon further pondering, I thought that might make them actually more uneven and likely to fall over. Plus my only rocks are in a disgusting wet pile in a laundry tub that was last year’s water feature, and I might get lockjaw if I touch them. (I’m waiting for all the water to evaporate, which it never will.) So far, we’ve had some strong winds and they haven’t tipped over. On an unrelated note, does anyone want to come over and clean up some rocks? They’re super-gross. I don’t want to touch them. It could be like a volunteer gardening kind of thing. Bring your kids! They can learn about where food comes from!